Financial Services Commission Chairman Choi Jong-ku takes an oath during the parliamentary audit of the top financial regulator Thursday. The top financial regulator has clarified its continuous ban on initial coin offerings (ICOs) despite mounting calls for allowing ICOs from the political community and the blockchain industry. 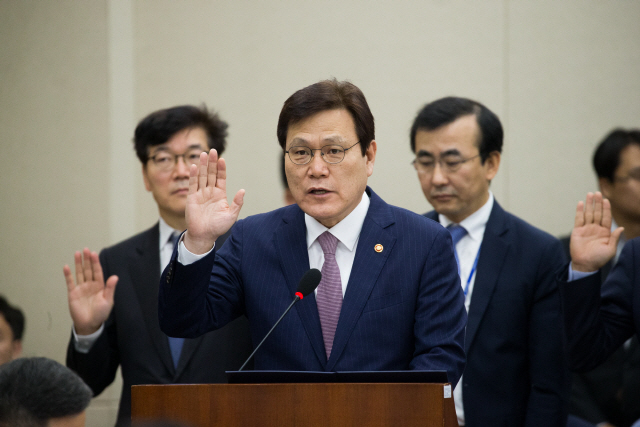 During the annual parliamentary audit of the Financial Services Commission Thursday, Choi Jong-ku, the regulatory agency’s chairman, said, “While uncertainties related to ICOs remain unchanged, what we would suffer (from allowing ICOs) is too serious and clear.” Choi made the remarks while answering a question by Rep. Chun Jae-soo of the ruling Democratic Party of Korea who had called for lifting a blanket ban on ICOs. He remained firm on banning ICOs, saying, “No one can deny the blockchain industry is promising but blockchain and cryptocurrency need not go hand in hand necessarily.” Coinplug CEO Ryan Uhr attended the audit as a reference witness and stressed the need to lift the ban. But the head of Korea’s top financial regulator reacted negatively. On Wednesday, Hong Nam-ki, who leads the Office for Government Policy Coordination, told lawmakers that the South Korean government will make a final decision on whether to reinstate ICOs in November. South Korea issued a blanket ban on all ICOs in September last year as the cryptocurrency market overheated. In a related development, Rep. Jeon Hae-cheol of the governing party accused the government of “having also caused confusion last year after failing to fine-tune its position on cryptocurrencies.” “It defies understanding that Choi, who is leading an agency in charge of blockchain policies, makes a contradictory statement,” he said.